Caption reads: Miss Maud Younger, financially independent, who has served as waitress in a restaurant on her own property because she is a trade unionist first, last, and all the time. As a San Francisco socialite for her first thirty years, Maud Younger could have lived comfortably. A chance, almost quirky twist, changed her life forever. Going through New York City on the way to Paris to visit her father, she decided to “see the slums” and stopped at the College Settlement. That “tour of the slums” took five years. She emerged as a radical, an organizer, and a champion for the working woman. In New York she became a waitress and concluded that waitresses must be organized, unionized, and protective legislation for them must be passed. In San Francisco, in 1908, she pioneered a waitresses union, became president of the local, and served for three terms as delegate to the Central Trades and Labor Council. She advocated the amendment for the eight-hour workday for women. The amendment along with women’s right to vote, passed on October 10, 1911. Having won suffrage in California, she joined the national campaign for the Nineteenth Amendment in Washington, D.C. Although she was a petite woman, she possessed an impressive oratory. She gave the keynote speech to the founding of Alice Paul’s National Woman’s Party, and the memorial oration for Inez Milhoulland Boissevan’s funeral in Washington, D.C. She became the spokesperson for the National Woman’s Party, and toured America declaring the mandate of the Party. In step with Alice Paul’s confrontational style, Maud Younger organized demonstrations, public meetings and pressured politicians by directing constituents to demand the Nineteenth Amendment from Congressmen. A powerful voice and a spirited leader. 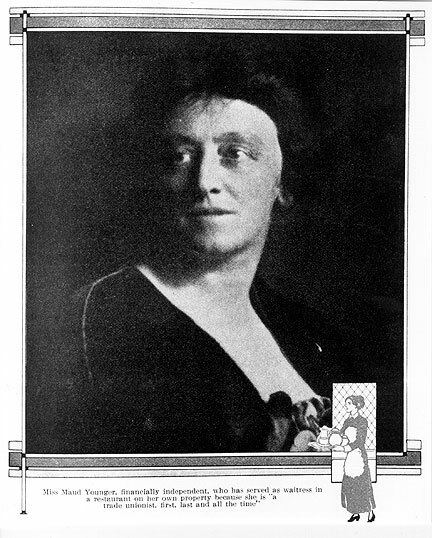 Minna O’Donnell represented the vigorous level of labor’s support on behalf of woman suffrage in San Francisco from 1909-1911, when the Union Labor Party’s candidate, Patrick McCarthy was mayor of the city. He came out for woman suffrage. Louise LaRue, head of Waitresses’ Local #48, started the Wage Earner’s Suffrage League in the city. Minna O’Donnell joined LaRue in leadership of the League. When Maud Younger became the third side of this triangle, she brought the middle class suffragists and the working class women together on behalf of suffrage. The League’s action likely led to the precious few majority votes women won in the precincts of the working class neighborhoods of San Francisco. In her acute treatise below defining the connection between labor and political power and with a strong class consciousness, Maud Younger also exposes the racism inherent in the women's suffrage movement when she compares the situation of Chinese and other ethnicities to women. More than seven million women in the United States daily leave their homes to go out in the world and fight beside men for their living. They work under greater disadvantages and temptations than men, they work for longer hours and lower wages, they bear the greater burdens of our industrial system, yet they have not the protection which men have of the ballot. Good laws are event more necessary to the woman, for she is the mother of the next generation, and upon the conditions under which she works depends largely the health of herself and of her children. The stunted growth and impaired vitality of the English working people to-day are the direct results of lack of legislation in their behalf when the introduction of machinery made possible the great exploitation of labor. It is of the utmost importance that there should be good factory laws, that a woman should work under sanitary conditions with protection for life and limb, that she should not work long hours, nor late and night, etc. Yet she has no representatives to make or enforce the laws so necessary to her and the community. The women of California are in daily competition with Asiatics. They have a constant struggle to maintain wages and conditions under which white women can work and live. Yet, the native-born Chinese have a weapon far more powerful than any that she has. They can vote for the law-makers who govern her, and she cannot. The working women of California have gained everything themselves, inch by inch, through the Union. Without a voice in the government, they turn to the Union for protection. They give it their allegiance. But the Union cannot do everything. They need good laws to protect them at home as well as at work. And they need good laws far more than the rich. If food is impure, trust prices exorbitant, dwelling houses unsanitary, public schools bad, public hospitals poor, street cars abominable, police protection inadequate, the rich can pay for private service. The poor have no choice. All these things directly concern women. Her home, her children, are her especial province, yet she cannot demand the laws necessary for their protection. There are two ways to secure laws--by vote and by "influence." Wage-earners cannot afford "influence." They must elect men who will pass and enforce the laws they need. Legislation in the interests of the working class does not come unless they demand it. An appeal to the courtesy of legislators is never so effective as a demand backed up by votes. Te workingman's vote looms large and threatening on the politician's horizon. The woman's vote is necessary to secure the woman's interests. Even in the labor movement, where women are probably treated with greater courtesy than elsewhere, they find that they must constantly look after their own interests. Working women are the backbone of the English suffrage movement today. Formerly women did not have separate interests. Everything now made in the factory was then made in the home. There materials were woven, clothes, rugs, candles, soap, matches, butter, cheese, etc., etc., were made. There women did the work. They did not come in contact with the outside world nor share its responsibilities. That was left to the men, and men made the laws to protect their own interests. Women had none. They were not even tax-payers. Everything they had belonged to their husbands. A man could even will away his unborn child. But when the introduction of machinery removed work to the factories, women were forced to follow. They no longer made at home the things they needed; they had to go out in to the world and earn the money with which to buy them. The status of women was entirely changed. The form of any government and society depends upon economic conditions. A change in industrial life brings a change in laws and customs. Conditions under which women work and live are constantly changing and laws must be changed to meet them. Women are now in daily contact with the world; they do their work in the world and share its responsibilities with men. It is not their choice. It has been forced upon them. The proportion of self-supporting women is rapidly increasing. Self-protection requires that they should vote. Progress demands it. The grounds on which men have obtained an extension of the franchise are: 1--Government must rest on the consent of the governed; 2--Taxation without representation is tyranny. These arguments apply equally to women. There can be no democracy where half the population is governed without its consent. It is said that all the women will not vote. Well, neither do all men. But it would be unjust to disfranchise all men because a portion of them do not use the ballot. It is said that "women's sphere is in the home," but this does not apply to the seven million women in America who must leave their homes in order to live. Besides, no woman can keep her home pure in evil surroundings. A corrupt city taints every home in it. Where women vote, the home-loving women are among the strongest advocates of suffrage. And this has not been found to make them less womanly. Women now vote in New Zealand, Australia, Tasmania, Norway, Finland, and Isle of Man. They have municipal suffrage in England, Iceland, Scotland, Wales, Canada, Sweden, Denmark, and Natal. In England they vote for everything except parliament. In Finland more than twenty women are members of parliament. In five of the United States women have equal suffrage with men; in more than twenty others, partial suffrage. In different parts of the country the vote has been given to negroes, Indians, Hindoos, and other Asiatics. Have they greater interests to protect than have the American women? Are they more capable of citizenship? In California every adult may vote excepting only Mongolians, Indians, idiots, insane, criminals, and women. The country is looking to California as the next State to get the ballot. It is not a question of the indefinite future. The suffrage amendment has passed the legislature by a large majority in both houses. The question is before the voters.